Some of you wanted to see more of Peter Dunham's "Fig Leaf." Here it is in three subtly different colorways. 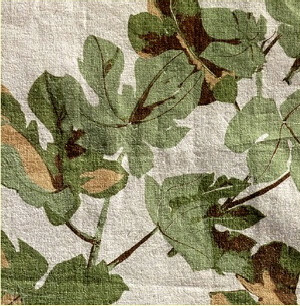 For details on Dunham's textiles, contact his new shop, Hollywood at Home. 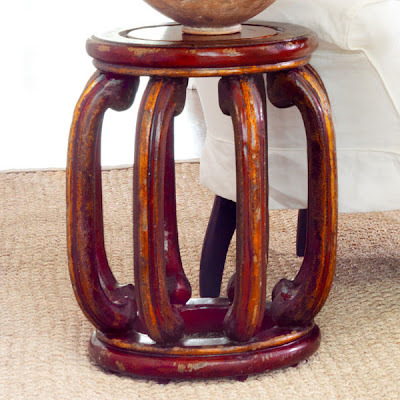 A reader has been searching for an Asian (or Asian-inspired) stool in red. Wisteria offers a hand-painted reproduction in oxblood red with some gilding and Chinese details. $219. I'm in the middle of an upholstery project (when the fabric finally arrives I'll share more) and I've been pouring over those bedroom tear sheets again, observing the balance of "soft" furnishings with harder, leggy pieces. 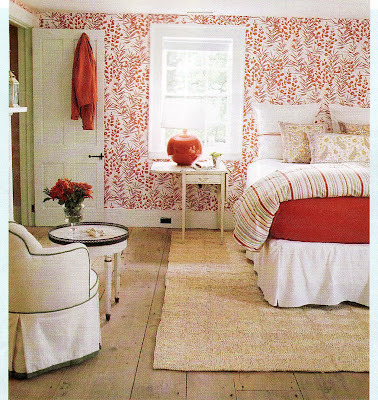 Among rooms that appeal, one common denominator I've noticed is a decidedly feminine -- yet absolutely not girlie -- quality. Below are bedrooms you've seen many times before. To me these are all graceful but never cloying. 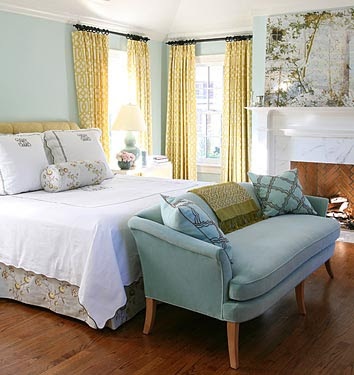 Bedroom of domino's Creative Director, Sara Ruffin Costello. Three bedrooms above designed by Ruthie Sommers. Above, a dressing room by Schuyler Samperton. 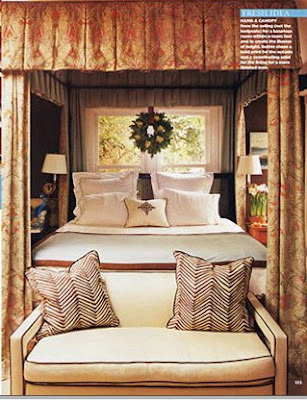 Below, a bedroom by Miles Redd, as seen in Elle Decor, November 2006, photograph by Simon Upton. Interior design above by Southerner Barrie Benson, as seen at Domino online, photo by Justin Bernhaut. 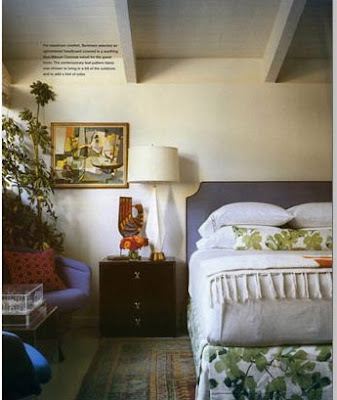 An island escape by Nicholas Haslam, as seen in The Bedroom, published by Abbeville Publishing Group, 1995. 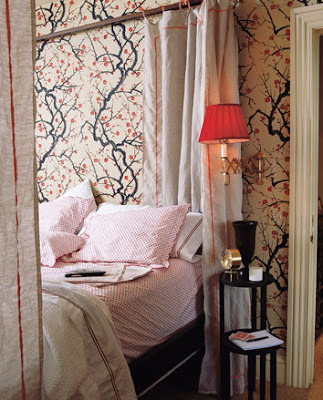 Top image of Aerin Lauder in her New York bedroom is from Bright Young Things, published by Assouline 2000. Photography copyright Jonathan Becker. 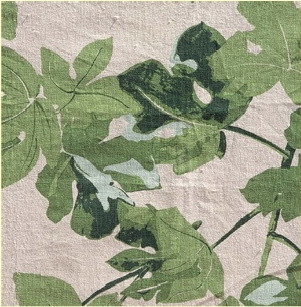 Recently I had in my hands a memo sample of Suzanne Rheinstein's "Palace Garden," a large-scale linen-cotton floral with the most beautiful blue background. To me it's sort of a toned-down Tiffany-blue. Prettier than the preview on my computer. 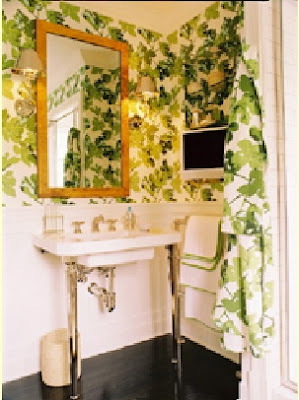 Fans of Rheinstein are well acquainted with the framed chinoiserie panels hanging in her L.A. house (I believe the wallpaper came from her husband's childhood home.) "Palace Garden" definitely seems inspired by these panels. Top image of Suzanne Rheinstein is from Inspired Styles, published by Assouline 2007. 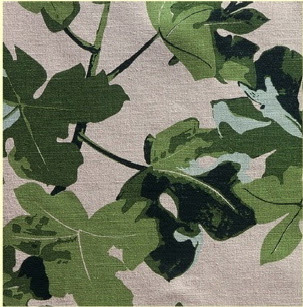 Over the weekend I was revisiting my Chloe Warner tear sheets, thinking about how Warner successfully covered a swap-meet sofa with Lee Jofa's stately hand-blocked linen,"Eldon." Along the way, I uncovered other examples of lush florals. 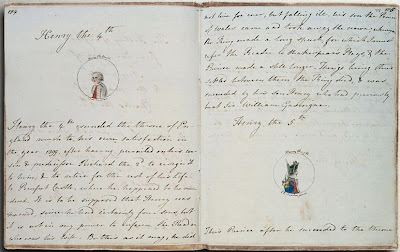 Images five and six represent a page ripped from Southern Accents. I think in the 90s. 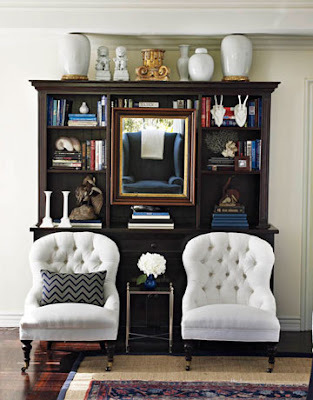 To me, the pouf shown is just an iconic flower-laden piece. 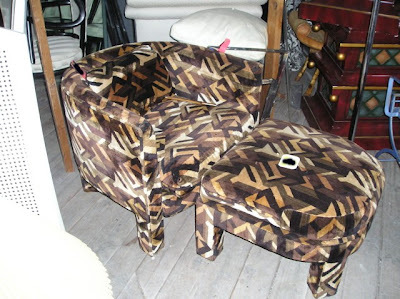 Maybe chintz. The room is sort of like a de-constructed Southern classic. Lighter than the '80s but still a bit grand. Last of course is Warner's library as seen in domino, November 2007. 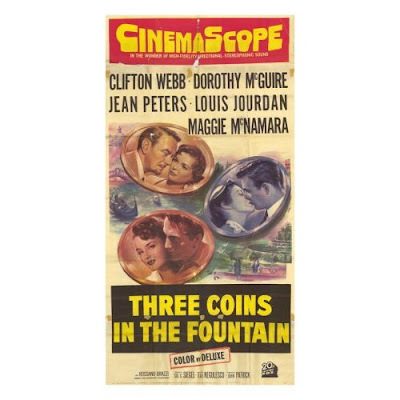 Friendly reader Gail tells me that the clean-lined rush chair used in the 1953 film, How to Marry a Millionaire, also appeared one year later in the movie Three Coins In the Fountain. Jean Negulesco directed both pictures. I haven't seen either yet, but Gail says "the girls' charming Roman apartment (in Three Coins) is to die for." 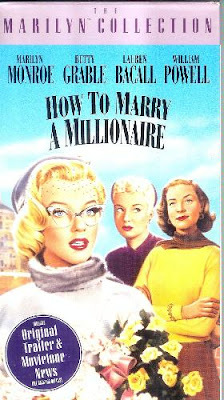 As mentioned in the previous post, Peter Dunham now sells a "How to Marry a Millionaire" chair in his new store, Hollywood at Home, seen top in Elle Decor, March 2008. I first became aware of Peter Dunham's "How to Marry a Millionaire" chair when Jennifer Garner's lovely garden was featured in Vogue Living. 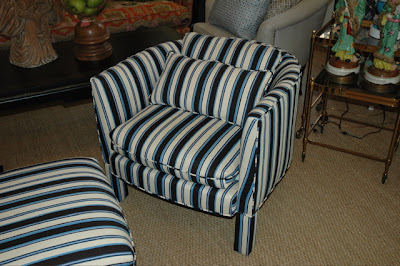 It's a striking rush side chair inspired by one seen in the 1950s film, How to Marry a Millionaire. 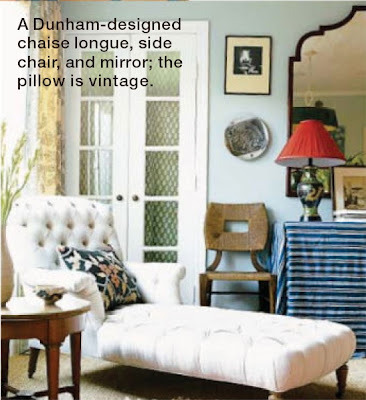 For those of you lucky enough to be shopping in L.A. this weekend, Dunham sells it in his new store, Hollywood at Home. 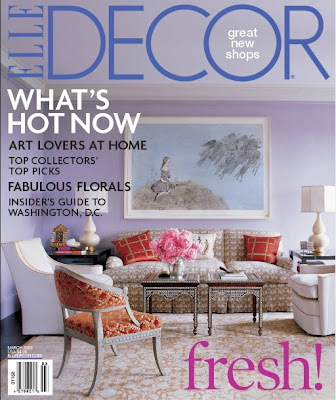 In the March issue, Elle Decor gives its nod of approval to the return of lush garden florals. 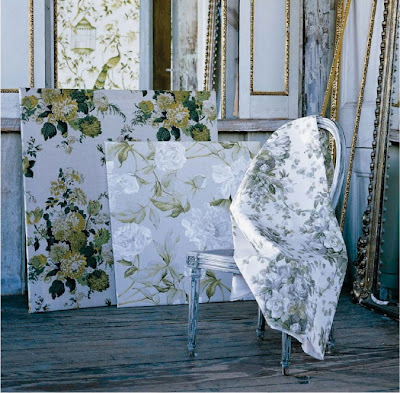 Exquisite cottons and linens covered with magnolias and peonies are highlighted. 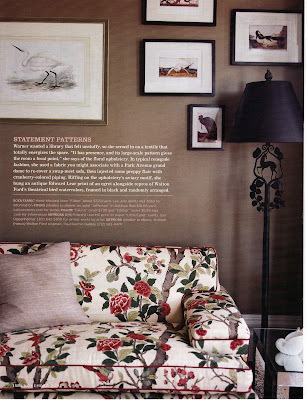 Also featured in a Katie Ridder-designed residence, an embroidered headboard by one of my idols, Lisa Fine. BTW: The shop of another design hero, Peter Dunham's Hollywood at Home, made the March issue too. 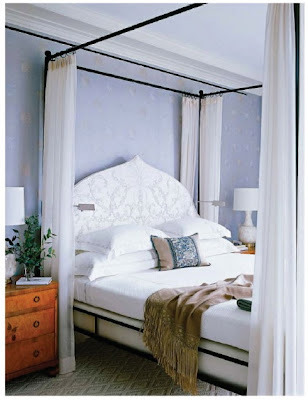 For times when you're experiencing decorating overload: a perfectly simple, exotic and chic escape on the island of Lamu as seen in The Bedroom, published by Abbeville Publishing Group, 1995. See also a great safari chic post by Girl Meets Glamour. Yesterday's posts skewed toward the feminine, so this morning I needed to inject something masculine. 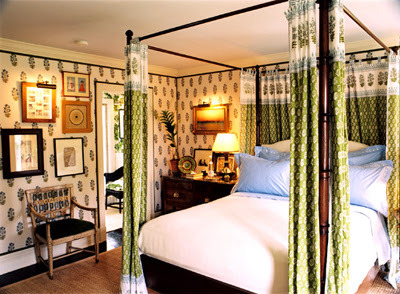 Nothing says gentlemanly more than the late Bill Blass' iconnic chocolate-brown-and-white Connecticut bedroom. Recently, it was the inspiration behind a Hollywood Hills bachelor pad decorated by Mary McDonald. In the last few years dark rich walls with crisp white trim have become trendy; I think it's interesting to see a seriously timeless room done in this way. 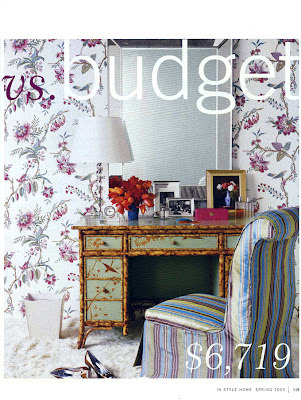 McDonald photos by Robert Trachtenberg for House Beautiful, February 2008. You've seen the before. Seen the after. 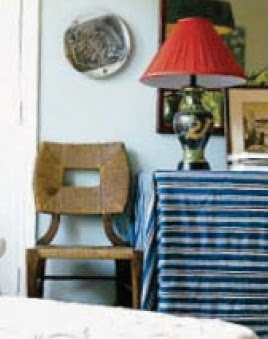 Now here's the chair in context, happily settled in the 18th-century Sag Harbour home of Margot Brunelle Fooshee, J. Crew's head of marketing. Her friend Ruthie Sommers is responsible for the chair's transformation and the lovely house. Makes you rethink Goodwill finds, doesn't it? 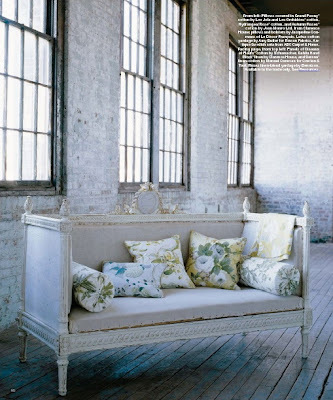 Photography, Don Freeman for House Beautiful, June 2007.